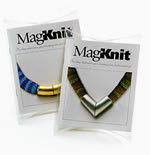 To order ready-to-wear necklaces, no knitting necessary, click here. Contains the MagKnit clasp of your choice, plus full color instructions, all in an elegant clear plastic pillow box. YOU provide the knitting, beading or other materials for your work of art. © Copyright 2004-2008, Barbara Zucker, Inc. Patent Pending.